President Donald Trump’s response to the Nov. 5 shooting in Sutherland Springs, Texas, highlights the striking differences in how he responds to recent tragedies. CNN reported the shooting killed 26 and injured about 20. That accounts for 4% of the small town’s population, according to Wilson County Sheriff Joe Tackitt. Trump offered “thoughts and prayers” for the victims and their families, but said now is not the time to talk about guns. That represents a stark departure from other recent responses. 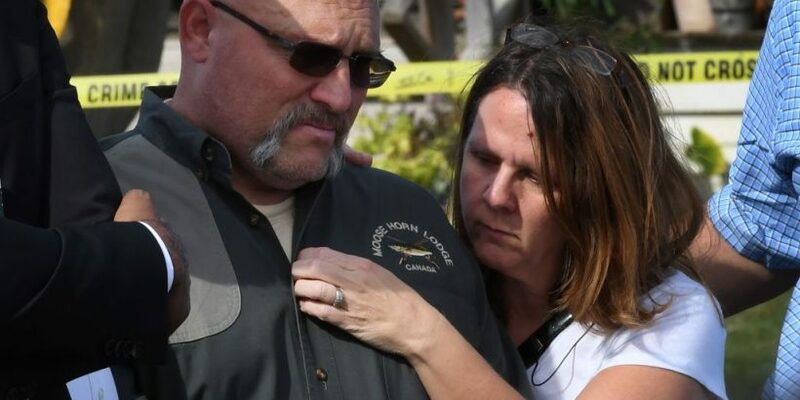 The shooter killed at least eight members of the same family, including a woman about five months pregnant. The victims ranged in age from 5 to 72 years old, said Freeman Martin, a regional director with the Texas Department of Public Safety. The pastor’s daughter and a visiting pastor both perished in the attack, Tackitt said. This event, which comes eight years to the day after the Fort Hood shooting, represents the most deadly mass shooting in Texas history. Federal officials called the motive for the shooting unclear. According to Tackitt, the shooter’s in-laws attended the church, although they did not attend that service. Tackitt also said investigators had contacted the in-laws. The shooter — who The Washington Post describe as a former member of the Air Force — burst into the service and fired with a Ruger assault-style rifle. A local man engaged him in gunfire before the shooter allegedly took his own life. Police found him, dressed in all black including a ballistic vest, dead in his vehicle. Texas officials identified the attacker as Devin Patrick Kelley, 26, of New Braunfels, about 35 miles north of Sutherland Springs. Kelley had been court-martialed in 2012 and sentenced to a year in military prison for assaulting his spouse and child. That makes him the latest mass attacker or suspect with domestic violence in his past. He was reduced in rank and released with a bad-conduct discharge in 2014. The president spoke from Tokyo, on the first leg of his Asia tour, on the event. “This isn’t a guns situation,” Trump said. “This is a mental health problem at the highest level. It’s a very, very sad event.” He offered his “thoughts and prayers” for the victims and their families, as well as pledging support to the Texas authorities and urging the nation to “join hands” and “lock arms.” The president did not suggest plans to take any legislative or other policy action to address the shooting. According to Politico, Senate Majority Whip John Cornyn and fellow Texas Sen. Ted Cruz also expressed their sympathies on Twitter. “Keeping all harmed in Sutherland Springs in our prayers and grateful for our brave first responders on the scene,” Cruz wrote. “Please say a prayer for First Baptist congregation, first responders & the community there,” Cornyn said. It is uniquely and tragically American. As long as our nation chooses to flood the county with dangerous weapons and consciously let those weapons fall into the hands of dangerous people, these killings will not abate. … [My colleagues] need to think about whether the political support of the gun industry is worth the blood that flows endlessly onto the floors of American churches, elementary schools, movie theaters, and city streets. Last week, a truck driven by Sayfullo Saipov killed eight people and injured 12 when he plowed down a bike path. Trump immediately after called for the suspension of the visa program that the attacker used to become a lawful permanent resident of the U.S. The president later took back those comments, but still called for the death penalty. By contrast, when a gunman killed 59 and injured 527 more in the worst mass shooting in U.S. history in Las Vegas, Trump called for prayers. NBC News lines up Trump’s tweets after Las Vegas, New York, and Texas, demonstrating the striking difference. The president’s past actions also show he will likely not follow up on his comments after the massacre with meaningful change. In fact, his recent legislative action directly contradicts his comments. Trump signed a bill into law in February rolling back an Obama-era regulation that made it harder for people with mental illnesses to purchase guns. As NBC News reports, the rule added people receiving Social Security checks for mental illnesses and people deemed unfit to handle their own financial affairs to the national background check database. Both the House and Senate later approved getting rid of that requirement.